From L to R: Richard McLean (d&b), Harry McCann (audio freelancer), Dave Isherwood (WL’s Technical Director), Tom Jeffrey (MD at SFL) and Lee Dennison (WL’s Head of Audio). As the technical solutions specialist, White Light is constantly investing in the very latest audio equipment to ensure its clients have access to state-of-the-art technology. Following the formation of its audio department four years ago, the company has continued to grow its inventory and recently made a significant investment in a range of leading audio products from manufacturers including d&b, DPA and Shure. 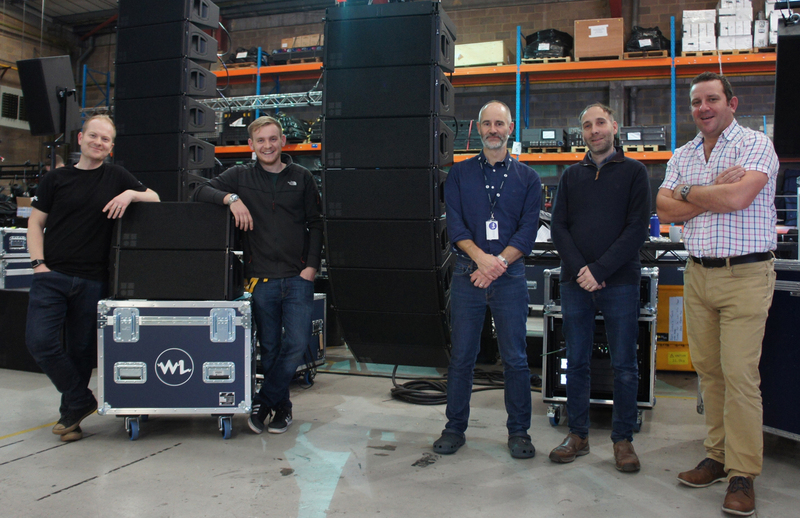 WL’s Head of Audio Lee Dennison comments: “Ever since we launched our audio department four years ago, we’ve formed a reputation of being able to supply customers with audio solutions bespoke to their needs. Alongside our existing relationships with leading manufacturers, our long-term plan was to start introducing further large brands in year four and ensure we have equipment that is industry-standard and suitable for the range of markets we work in, from theatre to live events to broadcast”. The recent d&b investment includes speakers from the E, Y and V series. Lee explains: “We are delighted to have made this commitment to d&b and take on a range of their loudspeakers. These are industry-recognised products and having them readily available in our hire stock will allow us to continue serving our client’s needs”. There has been an immediate interest in the d&b range and the systems have already been used on an eclectic range of events, including Six Day London at Lee Valley VeloPark, the UNICEF Halloween Ball which featured a live performance by Rita Ora as well as the WWF Living Planet Lecture at Central Hall Westminster. Lee adds: “With the d&b range already proving extremely popular, this not only showcases its versatility but also the fact that these industry-recognised products are often the first choice for a lot of audio professionals”. WL is also continuing its investment in DPA microphone products, including the eagerly-anticipated d:screet CORE 6000 series. This is DPA’s smallest high-end pro audio microphone capsule and has been developed from years of research with leading theatre, film and television professionals. Lee explains: “We are delighted to be continuing our relationship with DPA and this latest investment shows our commitment to both the brand and these fantastic new products. They are the go-to manufacturer when it comes to microphones, whether it’s for theatre shows, conferences or award ceremonies; making them an invaluable asset to our hire inventory”. As an Elite Rental Partner for Shure, WL has continuously invested in the company’s pioneering products. This now includes the brand-new Axient Digital Range. With an unprecedented level of signal stability and audio clarity, the Axient Range incorporates some of the most innovative wireless audio technology in the world. Lee explains: “We had invested in Axient earlier this year but we have now pushed into the ADX range of transmitters including the brand-new ADX1M. They are not only powerful but extremely discrete; making them a game-changer for the corporate market”. The d&b, DPA and Shure products are now all available to rent from WL’s hire stock and clients are encouraged to contact WL’s expert team with any queries they may have. Lee concludes: “What this latest investment indicates is our constant desire to pioneer the very latest products and ensure our audio inventory is industry-standard; offering our entire breadth of clients with the best equipment possible”.